In the name of beauty I'll try pretty much anything. Contouring, strobing, oil pulling, coconut oil for every nook and cranny all huge yeses and things I have been happy enough to try. Tooth powder however, just seemed like a bit of a strange and foreign concept. I had seen toothy tabs, oil for your teeth, but never a sub for stable tooth paste! That is until Lush introduced me to my new daily obsession, Ultrablast powder! 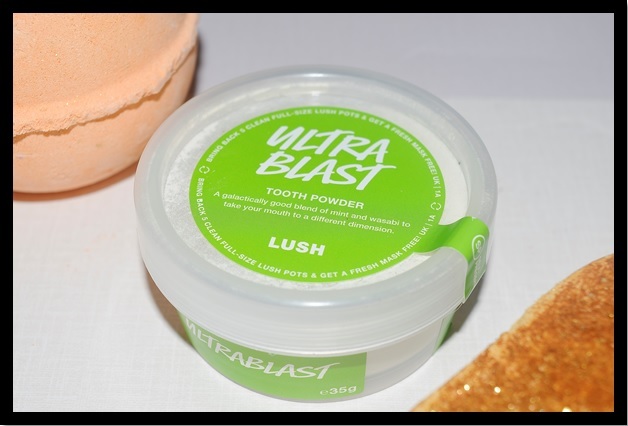 Lush describe Ultrablast as, 'A galactically good blend of mint and wasabi takes your mouth to a different dimension. This potent mix of garden pea powder, peppermint and spearmint will leave your mouth as clean as a whistle.' Sounds minty fresh right? I was taken in more so by the blend of mint and wasabi, I love spicy foods and that fresh feeling that a chilli, mint or obviously wasabi dish will give you so incorporating that into a health and hygiene routine, yes please! You use tooth powders by dipping your damp toothbrush lightly into the pot and then go to town on your teeth as usual. The texture is a bit difficult at first, I thought it would feel quite dry and bitty but instead it just lathers up into a very light foam, the hardest bit to get over for the one I ended up going for was the colour (green for those wondering, green!) but I will say was surprised at just how clean my teeth did feel afterwards, I'd even go as far as to say cleaner than using regular toothpaste. Since using this, twice daily over the last 4 weeks my teeth are looking a bit whiter than usual (not a quality they promote on their packaging) so I really do think the powder cleans better than a paste. The pot is really lightweight and pretty airtight when you put the lid back on correctly so it'll be great for when we are going off on holiday, or for packing in an overnight bag. These pots retail at £4.95 but I bought mine about 3 / 4 weeks ago and I'm not close to finished, suffice to say a little really does go a long, long way. The only drawback I will say is that it can get pretty messy. Mine for example has congealed a bit in the pot just with water getting in from my tooth brush. You can still use it however it has turned parts of it into a pastey mess! And my towels are perpetually green and powdery and the corners of my mouth?! Let's just say if you're partial to doing your skin and foundation routine prior to brushing your teeth - that's going to be something you'll want to flip around. Overall though I'm pretty pleased with my new oral routine and I'm definitely going to continue purchasing these in the future. I'm looking forward to trying their other flavours, for example their strawberry flavoured 'Tooth Fairy' powder and their cinnamon and clove aptly named 'Atomic' powder - perhaps one for the festive season! Have you ever tried a revolutionary tooth cleaning product? I'd love to hear what you thought or tried in the comments down below, come share your pastey experiences with me on Twitter or of course if you'd just like to keep up with me and my faces you can catch me on Instagram and the blog on bloglovin. Wow this sounds really interesting, I heard that the toothy tabs were awful but this sounds like the perfect product for travelling as being a powder you wouldn't have to stuff it in your clear liquids bag! Quite keen to give this a go and like the sound of all the flavours too! I was never drawn in by the toothy tabs though they sound like they may be okay for traveling or when you're in a pinch. Just ran out of this powder this week so going to treat myself to another one! Let me know if you give them a go and what you think of them - such a weird sensation at first! The Europeans of the Renaissance connected blanch to their teeth. They had more white teeth for a restricted period however as time passed their lacquer began to wear away bringing about tooth rot.